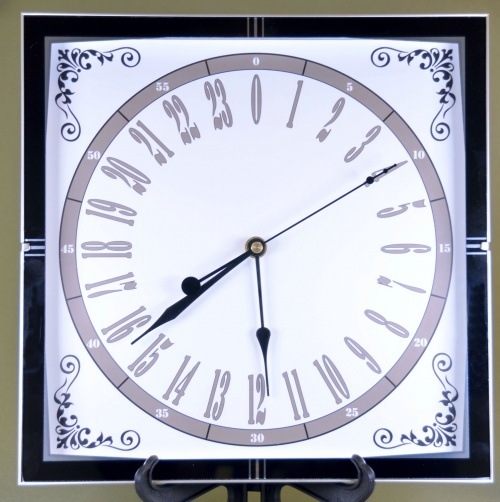 SPECIAL 24 Hour CLOCK - Ultra clear easy to read Night & Day offering the time of day at a glance in a fabulous Large Black and Chrome finish Clock with a super glass lens protecting the smart 24 hour day face. 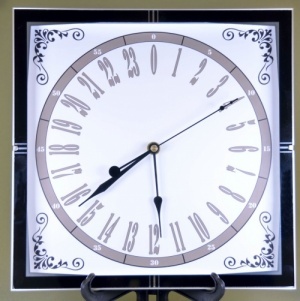 The 11.5" glass frame has black and chrome markings to enhance the clock. As you can see from this photo it's easy to read, it is 15:29 or 3.29 pm, creating an exciting future-proof clock which is gaining popularity for either your home or office. Fitted with a special quartz movement and metal indicator hands. Operated from a single Standard AA battery. Supplied with full Instructions and 2 year guarantee. Do you have a question? Our customer service team are here to help you.